Absent since 2004, Finland's Human Temple returns with their sophomore release Murder of Crows. Six years is too long to wait for this skilled and versatile band as their debut Insomnia was a solid work. 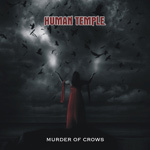 Murder of Crows continues Human Temple deliberate melodic rock course with some interesting twists to their repertoire. Not My Fault and Just One Night are solid AOR melodic rock standards with efficient use of catchy riffs, harmonies and hooks. But following this Promised Land throws you a curve. Starting much like a hearty blues number, it merges blues with a bit of metal heaviness and some real old school organ work to create a terrific song. Later, Yours Cold Blooded goes in a completely opposite direction sounding more like atmospheric pop rock. Emily also departs from convention being a metal-edged, fast-paced hard rocker made to feel an arena. Some may dismiss this versatility as inconsistency or unfocused direction, but they would be wrong. Rather, Human Temple shows welcome creativity and strong craftsmanship. Still, there are a few dull moments with Lie and Ghost of You; they're hardly bad, but the ones mentioned above are light years better. In the end, Human Temple's Murder of Crows is a strong second effort from a polished and creative band with some tricks up their melodic rock sleeves. Very recommended. Human Temple's Murder of Crows is a strong second effort from a polished and creative band with some tricks up their melodic rock sleeves. Very recommended.